To many people, a bed never becomes like the waterbed they had in the 80s. They still remember the extraordinary feeling of the warm, flexible bed. But at the same time, they remember the razor-blowing carousel ride, the fear that it dashed with cascades of water, and not least the spouse’s movements that set off in the great storm of the North Sea on the bed. In the 80s the number one bedroom hit was water beds. Around the small homes, it was pure happiness when the family climbed over the edge of the water-filled vinyl mattress at bedtime. The beds became cheaper and cheaper, while they became more and more expensive to heat up with rising electricity prices. The most significant disadvantage of the cheap waterbeds was just that they were cheap. Many times you heard of cracked mattresses flooding a whole detached house with a flood of water. The cheapest water beds produced and imported from eastern Europe. It was an unfortunate quality that people at the same time had to pay 300$ in electricity per year to heat up. Therefore, the interest in water beds fell. The new waterbeds are heated for approx. 50@ per year. It’s the same as a regular refrigerator user. The waterbed we at bedroompedia like the most is from Akva Waterbeds in Ry, Denmark. The Danish company has produced waterbeds since 1981. While the Danes turned their backs to the waterbed, the company has had great success beyond the country’s borders. There are an increasingly ask for waterbed in the market. Many are surprised by how a modern waterbed differs from what they swam in the 80s. Earlier, a waterbed, quite a wooden frame, often in particleboard, was filled with a large vinyl bag, which was then filled with water. 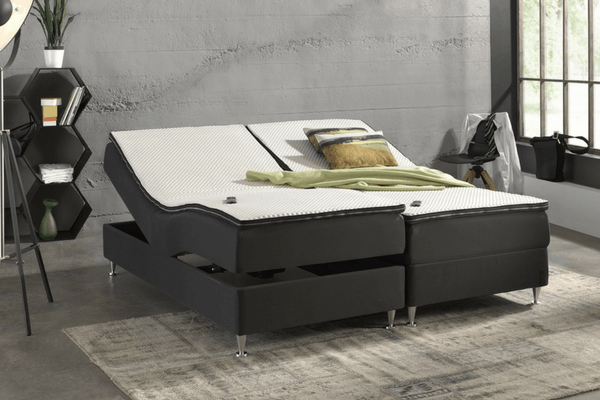 The new generation of waterbeds has a beautiful frame of soft, flexible material. You can have fabrics – or leather upholstered, or you can choose different types of wood. Yes, it can even be obtained on legs or with drawers in the socket. Akvas waterbed is the only waterbed manufacturer with ISO 14001 environmental certification and ISO 9001 quality certification. Also, the product Eco-Tex 100 is labeled, and the mattresses are entirely free from phthalates. Finally, the double bed can now also be divided into two separate cushions with a stiffening of water or foam in the middle. This has incredible benefits. One of them is that you no longer feel movements from one side to the other in the bed. Another advantage is that you can choose different attenuations on each side. You can select mattresses that come to rest after 0-25 seconds. A total of 12 different attenuations are available. And then there’s the problem when one party wants to get back to time with the soft bed of the waterbed, while the spouse gets lost in the water. Here too, a two-piece mattress is an advantage. You can choose a cushion that makes the mattress feel like a conventional known box mattress on one side and one more living on the other hand. In general, the new water beds are of much higher quality than the old ones. Everything from the heater, the vinyl, and the frame structure has undergone significant development. But fortunately, water is still water. So the beautiful flexible and warm bed comfort areas in the happy 80s. 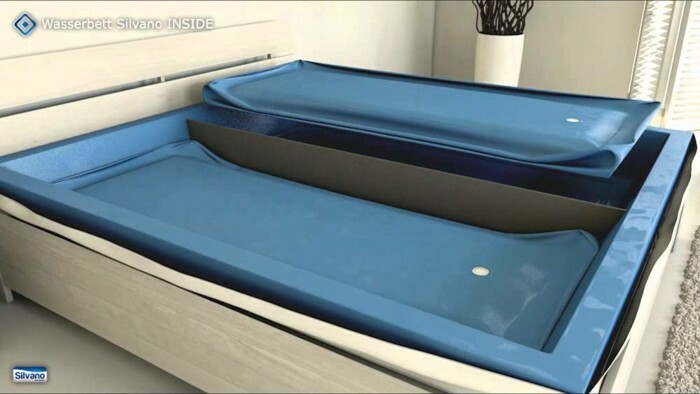 Here are the 20 most common questions about water beds – and answers. What is the benefit of sleeping on water? The mattress’s long life without coincidence, i.e., the water mattress always holds its shape. The first water bed was made of goatskin and was sun-heated. It was invented more than 3,000 years ago in Persia. In 1851 patented British Dr. William Hooper a water bed of rubber to prevent ulcers and help hospital patients to improve the comfort of the bed. And in 1960, American Charles Hall further developed the waterbed with new materials and a new production technology. But even to all inventors was that they all used nature’s most natural element – namely water – for optimal sleep. On a hard side is the water mattress in a robust wooden frame, possibly with a base underneath. The Softside bed is designed with a structure of polyether foam that is comfortable to sit on. It is also placed on a pedestal, so the height is comfortable. What is the difference between the different mattress types? You can not see the difference – but you can feel it. The difference is inside the mattress. It is partly the “wave damping” that determines how fast the mattress settles in after you have laid down and the construction of floating plates that support your body as you lie down. Try the different types and choose the kind that suits you best. Is it healthy for the back to lie in a waterbed? Absolutely yes. No other bed gives your back this perfect support. The mattress follows and supports your entire body, and no matter how much you weigh, you have a sense of weightlessness in a waterbed. Wakes my partner when I go to bed? In the muted models only if you jump into the bed. If you act normal when going to bed, there are usually no problems. No. When you move in a waterbed, you can feel that the water is also moving. When you are resting – the water is also at rest immediately. You can choose a “wave damping” from steamed to 99% dampened. Choose the one that suits you best. Is the love in a waterbed enjoyed? Your love life is not negatively affected in a waterbed. Does the water splash and alarm? No. A waterbed is entirely silent. And if there is sound, there is air after filling, which is just closing out. Is it easy to get in and out of a waterbed? If you choose a soft side, it’s like a regular bed. If you select a hard side, just try a few times and then it’s no problem. Can I sit on a waterbed? Yes, with a pillow in the back you sit beautifully. You can also choose a wedge-shaped pad that provides excellent back and arm support. Can the bed break through the floor? No, even though a large waterbed weighs between 170 and 900 kilos, there is no danger. 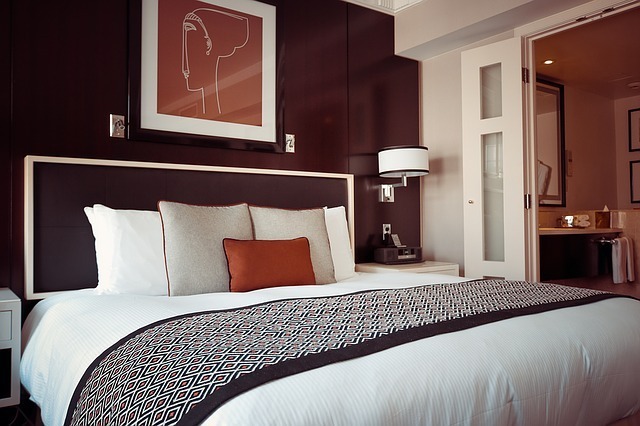 The weight of a double bed is evenly distributed over a large area of approx. 4 square meters. A human being on, eg. 90 kilos have only the feet to spread the weight – so if the floor can hold an adult – it can easily be a waterbed. What happens if the mattress gets leaky? The risk of it getting leaky is minimal. Wa’core vinyl is incredibly durable, and all joints are double-woven and are well protected under the mattress. However, the accident happens. Nevertheless, the water becomes in the safety cloth and never reaches the floor. Can the children jump in a waterbed? No problem. The wave damping and floating plates will automatically come into place shortly, and the bed is as good as before. How often does the water change? Only if you need to move. The water should be added to algae and bactericidal agents once a year, so it should never be changed. Is a water bed easy to move? Yes. It is much easier than a typical bed. It does not fill up very much and can easily be in a passenger car. All it takes is that the bed is emptied of water. Use a garden hose and the water runs out of its own, or connect a pump, so it’s even easier to unload the bed for water. Can the mattress be cleaned? A waterbed is the most hygienic you can sleep in. The smooth surface is just wiping away, and dust mites can not “hide” on the vinyl. Do I sweat in a vinyl mattress? No, not if you use a Wa’core roller pad and keep the water temperature as your outside temperature of 28-30 degrees. Does my house insurance cover if the impossible happens? Generally yes. Most policies have them insured in the same way as washing machines, etc. If in doubt, contact your insurance company. What kind of person buys a waterbed?